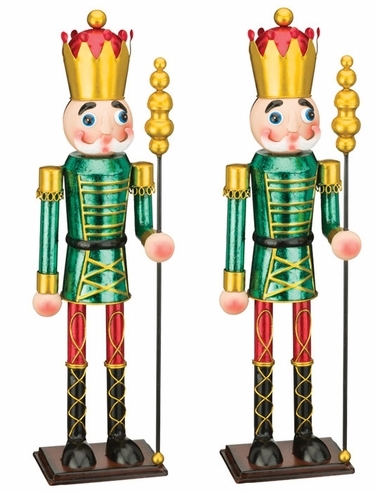 If you're looking to add some classic holiday cheer to your home, garden or office, you'll enjoy a magical pair of nutcracker style 19" Toy Soldiers wearing antique green jackets each holding a traditional club. Featuring impressive craftsmanship with meticulous attention to detail and unique metal finish. Showcase two or more together in mixed colors for added charm. Sizes: 4.75" x 19"H. Metal. Flying Friends Solar Garden Stakes (Set of 3) | Solar USA American Flags (Set of 3) | Silver Starburst Wall Decor | 32" Rustic Turbine Wind Spinner | Linus Rain Gauge - Patina Bronze | Lucy Rain Gauge - Patina Bronze | Lucy Bookworm Planter - Bronze Patina | Green Flower Nesting Planters (Set of 4) | Giant Metallic Mermaid Statue | 19" Red Toy Soldiers w/Horn (Set of 2) | 19" Green Toy Soldiers w/Club (Set of 2) | 19" Blue Toy Soldiers w/Drum (Set of 2) | 30" Red Toy Soldiers w/Horn (Set of 2) | Vintage Christmas Mailboxes (Set of 3) | Medium Christmas Train - Red | Large Christmas Iron Train w/Cart | Large Fire Truck Engine Decor | Blue Mum Wall Decor | Large Ferris Wheel "Atlantic" w/8 Hanging Lanterns - Antique White | Large Cinderella Carriage Stand - Antique White | Large Victorian Christmas Sleigh "LUCIANA"